The regatta clothing is being seen on many of those attending WHYW. There are still a few items available and these can be purchased/collected at the prize giving tonight from 8pm at the Argyllshire Gathering Halls in Oban. If you would like to reserve please let us know item and boat and we can put it aside. Polo 1 2xl. 1xl. 1l. 2m. 2s. 1xs. Rugby 1 2xl. 1 l. 5m. 1s. Wind proof 1 2xl. 2m. 2s. Gillet 1 2xl 18. 2 xl 16. 1 l 14. T 1 2xl 18. 3 2xl 18. This was the first time that I’ve taken part in West Highland Yachting Week. We did not race on Sunday from Craobh so instead we went snorkelling just outside the Marina. My Brother and I saw lots of fish , sea urchin and starfish but the water remained very cold. During the feeder race from Gigha to Craobh there was every different type of wind possible- (I have never seen so many sails being put up and taken down in three hours as we did then.) As we got closer to Craobh the wind picked up and I got the boats best top speed- 15Knots- just as we passed Corryvreckan. This was good preparation for today’s Craobh to Oban Race. I was steering today and at the start all of the boats were like huge elephants charging at our tiny boat as we crossed the line of the 20 mile race to Oban- we were close to being over but just on the right side so that might be beginners luck! 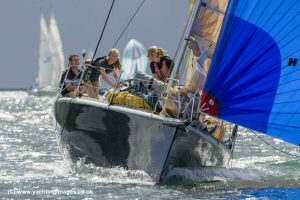 As we got closer to the windward mark all of the spinnakers were like a giant rainbow filling the horizon with colour. As we passed through the sound of Luing we some some violent whirlpools but passed without incident. 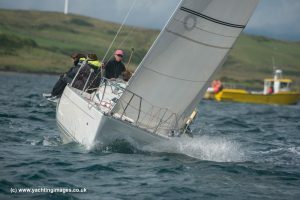 It then became windy during the race to Oban and we broached four or five times- but after the first one who’s counting! The closer and closer we got to Oban the more we could make out and we started to see the castles appearing from the green and hilly sourroundings. Oban to Craobh passage race as seen from Shadowfax (First 31.7). West highland yachting week 2018 started in Oban today on a warm grey (very early) morning. With very little wind in Oban bay the race team took the fleet down the sound of Kerrera for a start just south of cutter rock. WIth the breeze filling from the south east, the race team got us away without to much delay. At the pin end of the line Prime cut and Murray MacDonalds Autism on water battled it out with Shadowfax just to leeward. As the gun went the fleet were away with no recalls. On Shadowfax the spinnaker was set early and pulled us out to an early lead soon to be overhauled by the quicker boats of Taz, Warrior and Moonstruck 2. The race progressed through the inside of Insh island with not much place changing and all the spinnakers set. As the big boats rounded Easdale island the breeze built for a short period to Fladda where it became to tight to continue with spinnakers, and the fleet changed onto headsails. We were then duly reminded it was West highland yachting week as the heavens opened, and rain, yes rain like you have never seen before killed the breeze and morale! It was still warm though. A short beat in light breeze took us to the orange turning mark where kites were once again set and a gentle run up to the finish line off Craobh rounded off a fine days sailing. With the tide under the keels all the way the fleet was quite close right throughout the finishing order. Results just in and Marisca took a fine win in just under a minute on corrected from James Hardies Taz , with Shadowfax a close third. Warrior was fourth and rounding out the top five was Murray MacDonald’s Autism on water. 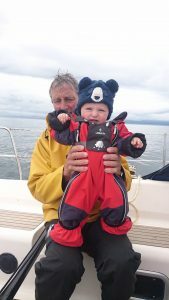 A fine achievement for his first West Highland yachting week with the 707. Thanks to all the organiser and sponsors and roll on tomorrow when the serious business starts for the points series. As everyone was leaving the marina for the first race it’s safe to say we were pretty optimistic about the weather. Applying sun cream and changing into shorts we were looking forward to a nice dry sail hoping that this would not be another ‘Wet Highland Week’ and a sign of what’s to come, but of course we should’ve known better. Shadowfax pulled of a cheeky port end start and led for most of the first round whilst we can only assume Mr Tunnock was still busy dishing out superior quality confectionary giving everyone else a chance as he was 5 mins late to the start. After the start things got very shifty when it turned into a game of Snakes and Ladders with Amber Haze reaching the top of the final ladder for a well deserved first. A few soggy sandwiches later in the pouring rain it was time to set of for race 2. With the wind dropping by the second Leaky Roof 2 tried a risky port flyer and let’s just say it was more flop than fly. 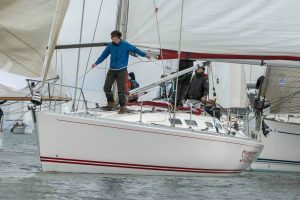 With the wind dropping to 0kts and the rain clearing away, the whole fleet came to a standstill while the committee boat Chico shortened the course to just 3 rounds. Sitting in complete silence the Roofers were running out of ideas and energy so we took to the stash of caramel wafers for inspiration which seemed to work until one member dropped the main halliard instead of the pole up-haul smashing the boom full force onto his wife’s head but more importantly slowing the boat down! At the end of a rather long day Leaky Roof 2 managed to Schneckle their way past the rest of the Class members to top place even managing to overtake Carmen 2 from Class 3. 6 hours of snakes and ladders even drove the skipper to a performance of American pie behind the wheel. There was many stops and starts resulting in the fleet bunching together, raising tensions getting the skipper all agitated that we were being passed left, right and centre. The lack of wind made getting a lead very difficult and we had hoped the last beat to the finish would be enough to pull away from the fleet, however today we were not so lucky. 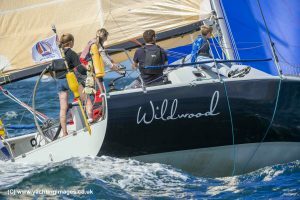 To our delight, the chocolate box appeared on deck and Max, the youngest of the crew age 12, lost his tooth to a curly wurly during the run down the sound of Shuna. The wind strength and direction was, for the most part, nothing from no where. However, it was predominantly south and finished in the west. When the rain came on, the steak pies and special hot chocolates fortified everyone’s spirits. At the end of the day, it’s the taking part that counts and the real prize is the memories made. Don’t forget your Rock’n’Roll outfits for Tuesday night at the Argyllshire Gathering Hall – think Elvis, Buddy Holly, Chuck Berry, Jerry Lee Lewis!